We stayed at the Ospizio at the Passo del Bernina (2309m, good for acclimatistion). After a very hearty buffet breakfast we left the Ospizio (hotel) at about 08:00 and crossed the road to start skiing behind the Cambrena restaurant. There were well established snowshoe tracks but no previous ski track. The line essentially followed the summer footpath, somewhat undulating and passed beneath the line of electricity pylons. We reached the large stoneman (cairn) at point 2416m. This is where the most persistent snowshoe tracks finally stopped. On the west flank / northwest ridge there was a herd of an estimated 16 Chamois keeping well ahead of us and we thought we will just follow their tracks up the peak. 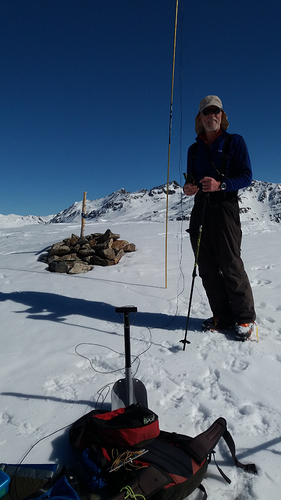 However, the slope proved to be too steep to ski up so we deposited the skis at just above the 2400m contour. Using boot crampons and a single ice axe, plus a ski pole each, we climbed up the frozen snow just right of the rocks of the northwest ridge. Some of the snow was surprisingly steep and a slip from here would have been a major problem. Please be careful if you decide to follow this route. We were left wondering how the Chamois managed the ascent without crampons! In fact we did use some of their footprints to climb the slope. We continued up the snow flank on the right of the ridge (the left side of the ridge is very steep), then onto the ridge itself for the final few metres, with some scary traversing, to the large summit area. This was at about 10:00 hours. 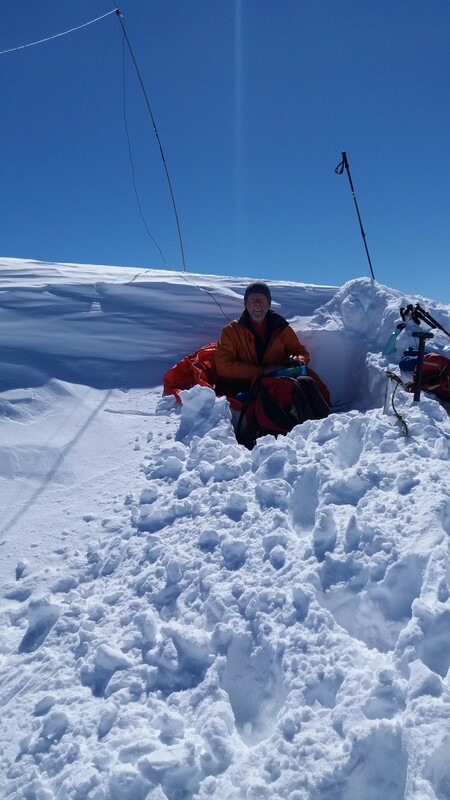 I used a 20 metre long inverted-V dipole on the flat snow covered summit, with more space for something longer. I was able to successfully Spot myself twice using a mobile phone. I forgot to note which Swiss network was used. We were lucky to have sunshine in a cloudless sky and absolutely calm conditions. Thanks to all of you chasers and the two summit to summit contacts. The descent was by the same route. The snow had already softened considerably and we had a comfortable time. The Cambrena restaurant is a few kilometres away and handy for a lunchtime beer. I thought HB/GR-115 would be an easy 10 pointer to activate, but the hard and steep snow we found, and some front pointing, made for a more interesting morning than anticipated. Now that is what I call a super and memorable winter activation. Well done. Hi Colwyn, I was listening for you this morning, but your signals at my summit had been too weak. I’m just back at home now, and your report is already written and on the reflector - wow, that shows us your priorities. Thanks! we were back at the hotel just after lunchtime so I had all afternoon to sit in the sunshine and write the report. Just had another super day out on HB/GR-054 today. `Temporary radio shack on the summit of HB/GR-054 today.